*Well ok it's not for sale - but I've got your attention! 😂 Here's my point - it wasn't much over a year ago that it was for sale! Using the waybackmachine and whois history you can see the development of the domain which eventually was bought by Microsoft seemly only in the last year or so. PowerPlatformUG.com was only registered in July 2018. Before Microsoft started using this name, the Power Platform was something to do with the Utility Power sector! 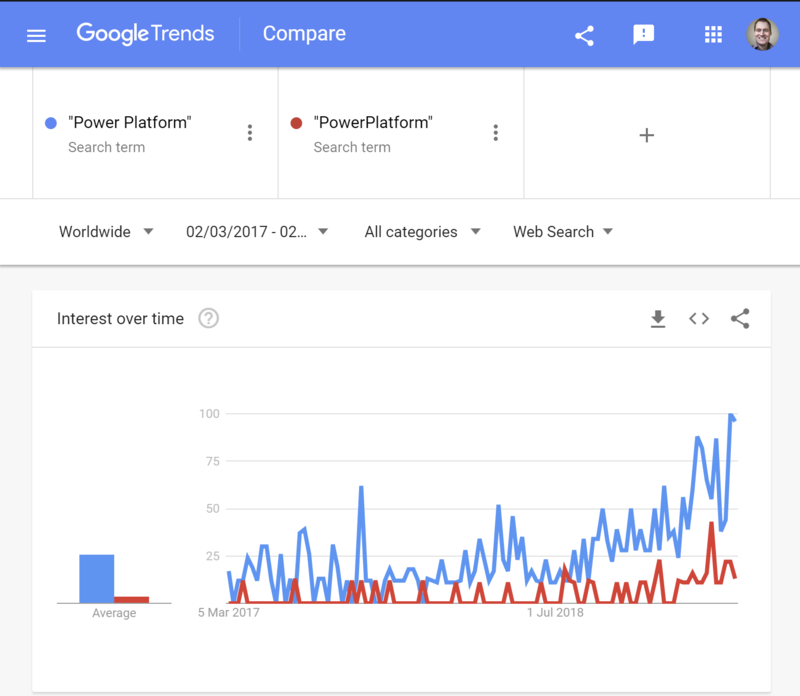 Let's consider that - the buzz that is happening around the Power Platform is barely a year old but it's now one of the most talked about topics amongst the Business Applications community. Wow! At the end of March, I had the pleasure of speaking at and attending the Power Platform summit in Amsterdam. The name seems great - but in reality, it was somewhat aspirational and folks actually registered to attend individual summits. The event was effectively an amalgamation of eXtreme365, the PowerBI, Dynamics365, PowerApps & Flow User Groups. Each speaker had their own background and product/technology focus. Hang on though - isn't that what the PowerPlatform is? A collection of technologies that all come from different backgrounds? Well sure that's where it's come from - but Microsoft are betting on it becoming something that is much more than that. So what is the PowerPlatform anyway? James Philips, VP of Business Apps at Microsoft, describes the PowerPlatform in his blog post from just a couple of months ago as a platform to "Analyze, Act, and Automate". He goes on to say that "We do this with Power BI, PowerApps, and Flow, all working together atop your data to help EVERYONE, from the CEO to the front-line workers, drive the business with data." I don't believe that there was ever a decision whilst Microsoft was working on Dynamics 365, Flow, PowerApps & Power BI to consciously build them in a way that could be unified, but over time it's become clear that the opportunity to combine these technologies together into a democratized digital transformation strategy was huge. Suddenly through this unifying strategy, the harvesting of code from Dynamics 365 to create the Common Data Service (CDS) Microsoft has been catapulted as the leader in the low code sector as defined by the Forester Wave report recently reported by Charles Lamanna. I had the honor of meeting Charles at the recent MVP Summit and I was struck by his sense of vision and ambition to truly revolutionize the area of Business Applications. Do you remember when Dynamics CRM rebranded to Dynamics 365 Customer Engagement? We were all rather confused because the change was in name only. This time it's not just a re-brand, with the PowerPlatform the change is for real! There is both a strategy and technology shift that we've not seen in Business Apps before. It is allowing both Pro-Devs, Functional Consultants & Information workers alike to collaborate together so that technology can be both governed and also productive at the same time. Those two aspects have traditionally been at odds with each other. It's clear that there is a recent increase in activity around Power Platform but it's still tiny compared to other keywords like PowerApps. The Power Platform was launched ever so softly into the wild that it's become somewhat of an enigma with people talking about it but without really knowing where it came from or what it meant. With the Common Data Model announcement at Ignite 2018 (Open Data Initiative collaboration between Microsoft, Adobe and SAP) there was a feeling that the Power Platform was more a philosophy than a product. Maybe just a collective term to talk about Microsoft's collection of technologies that had all been gaining traction in the market, underpinned by some strategic collaborations. 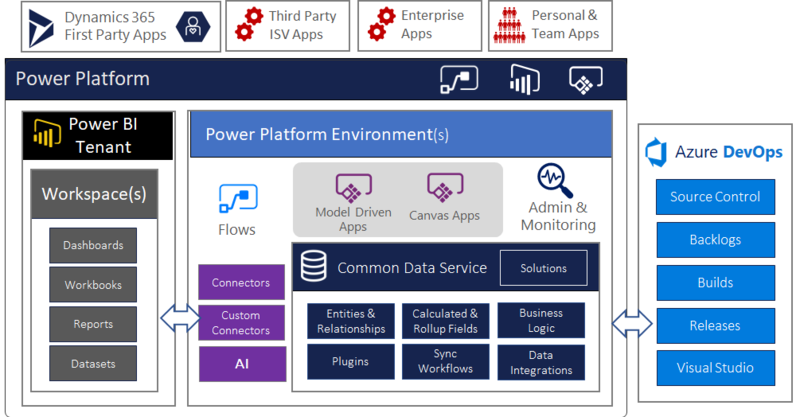 "Empower everyone to innovate with one connected app platform"
From a technology perspective, the Power Platform is the unification of Flow, PowerApps & PowerBI - all underpinned by the Connector ecosystem and the Common Data Service (CDS) that was 'harvested' from the Dynamics 365 for Customer Engagement XRM Platform. Furthermore, it's important to understand that PowerApps is not what it used to be in the days where it was closely coupled with SharePoint. Nor is Flow for that matter. They are now firmly underpinned by the Common Data Service. The unification of these technologies along with the tight integration with Office 365 and Azure makes the PowerPlatform such more than just the sum of its parts. The Power Platform means something very special in the digital transformation space - it is about the democratization of App Building within a consistent and powerful governed platform. In the latter half of last year, http://admin.dynamics.com started to redirect to https://admin.powerplatform.microsoft.com/ - so does that mean that Dynamics is no longer a thing? Not at all. Dynamics 365 now is referred to as 'first party' apps in that it is a set of apps built on the PowerPlatform by Microsoft (check out the top layer in my diagram above). Businesses are free to build their own to compliment or even replicate the Dynamics 365 apps if they wish. As Microsoft invest in the Power Platform adding more enterprise-grade features such as AI and analytics, these first party apps grow in their capability, making the value proposition even greater in the buy vs build decision. ...and there's more - the strap-line is "Unlock the potential of Dynamics 365 and Office 365 faster than you ever thought possible." Dynamics 365 is still very much alive!